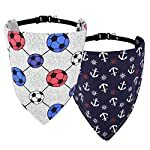 Creative Design and Adjustable Neck Size — The colorful football pattern and boat anchor pattern on these dog bandana scarf collars are interesting for your puppy dog. 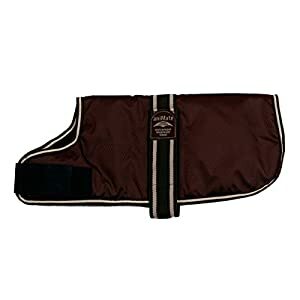 There are two sizes: Medium size neck girth(14.17inch-18.11inch),Large size neck girth(22.05inch – 24.41inch). Please measure your pet with a flexible tape measure and take the measurement a bit loosely to ensure the best fit. 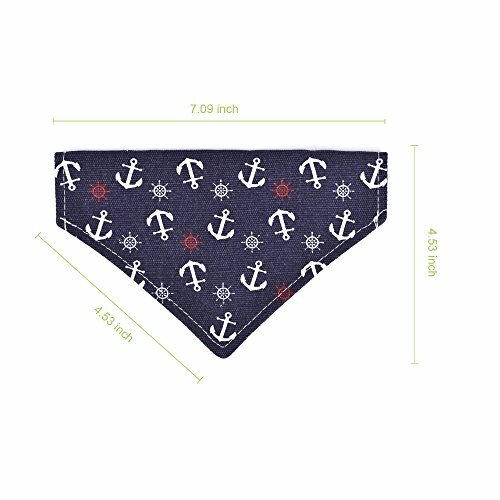 New Generation and Well Made — This dog bandana scarf collar is made up of two layer polyester fabric, the triangle shaped design which will not be rolled up when your dog wear it. 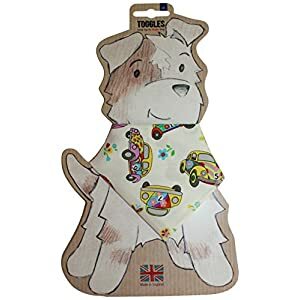 The 0.4 inch wide soft suede strap is comfortable for your puppy dog’s neck, which is not tight to be scratched. Detachable and Wide Application — This dog scarf collar can be easily taken on and taken off for convenient washing. Comes with a D-ring to attach a leash if you want to go for a walk with your pets. 1. 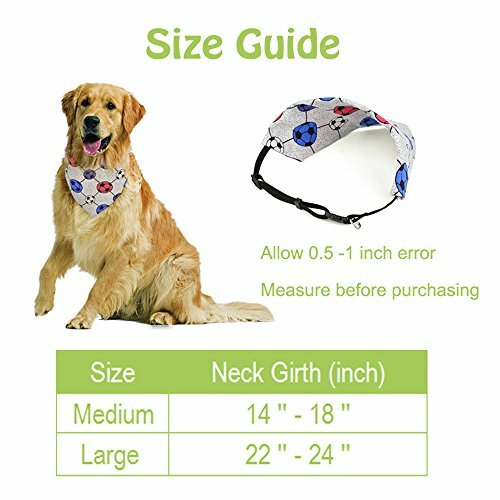 Please kindly measure your pet dog or cat’s neck girth before purchase. Please allow 0.5-1.5inch error due to the manual measurement. 2. Please kindly allow the prints on the triangle scarf maybe not appear exactly the same as seen on pictures as the scarfs were made of a whole piece of cloth. 3. Please kindly recommend wash by hand. Detach the scarf and the strap before washing and wash it gently with soapy water. 4. 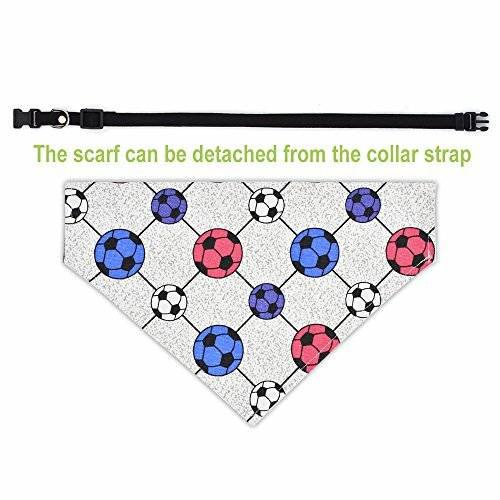 Please don’t allow your puppy to chew the scarf and keep away from fire. 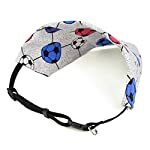 1.This dog scarf collar is ideal for these dogs and cats, such as Teddy, Teacup Puppy, French Bull dog, Garfield, Border collie, Golden Retriever and so on. 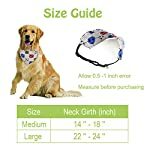 Just for your reference, please measure your puppy before purchasing. 2.The material we adopted is the soft suede strap, which can be protective to avoid damaging your pets’ neck. 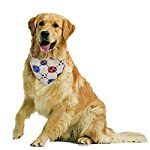 Why choose the SlowTon Pet Dog Bandana Scarf Collar? 1. 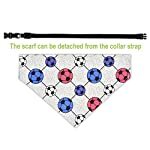 This dog scarf collar is comfortable and durable for most occasion, everyday use, dressing up, party costume, weddings, birthday, holidays and outdoor activities. 2. There is a metal D ring on the strap which can help you attach a leash for a walk. 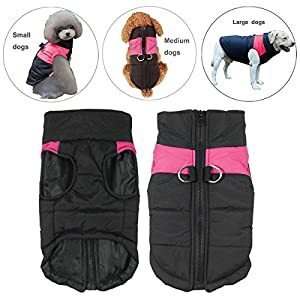 Easy to Wear and Adjust — With a plastic quick release buckle and clip for easy fit safely, the soft strap length adjustment which is to the utmost extent comfortable for your dog. 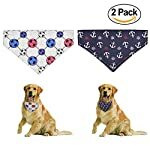 A Nice Gift for Pets — There are two sizes of this bandana scarf, which are suitable for dogs and cats for your reference: Medium Size (Teddy, Teacup Puppy, French Bull dog, Garfield, etc. 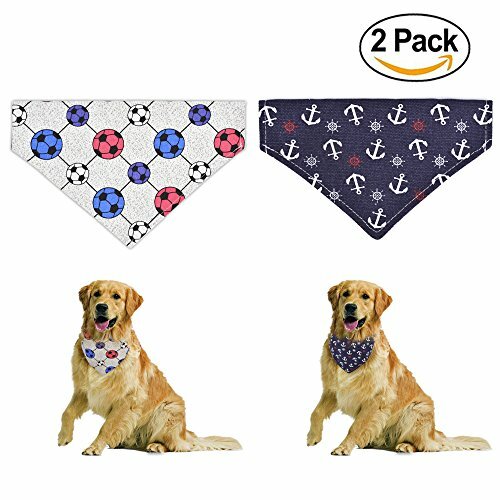 ), Large Size (Border Collie, Golden Retriever, etc.). 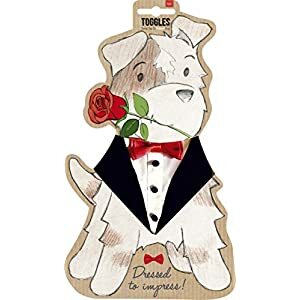 Especially suitable for daily use, like perfect for dressing up, party costume, weddings, birthday, holidays and outdoor activities.